There are publishers, 3rd parties, and others in the digital publishing space that have claimed that display ad rates have been in decline for years. This idea is supported with thin evidence of a growing monopoly at the top among top publishers and platforms —ultimately leading to lower CPMs. Digital ad rates are higher than they have ever been before. That’s a fact. What’s more, publishers that understand how higher CPMs, digital ad rates, and visitor engagement all work together are poised to see increased ad earnings on their website’s for the foreseeable future. Digital publishers are obsessed with CPMs and it is costing them a fortune. Below, I’ll show you how getting higher CPMs can ultimately cost you a lot of money. I’ll highlight how CPMs are manipulated and discuss how to go about increasing total ad value and ad earnings in a different way. They are incredibly easy to manipulate and allow these networks to deal in information that publishers are often missing. For example: Pretend I’m an ad network. I come to you and promise to guarantee you that the CPM of my ads will be twice as high as your current ads. What do you have to lose, right? 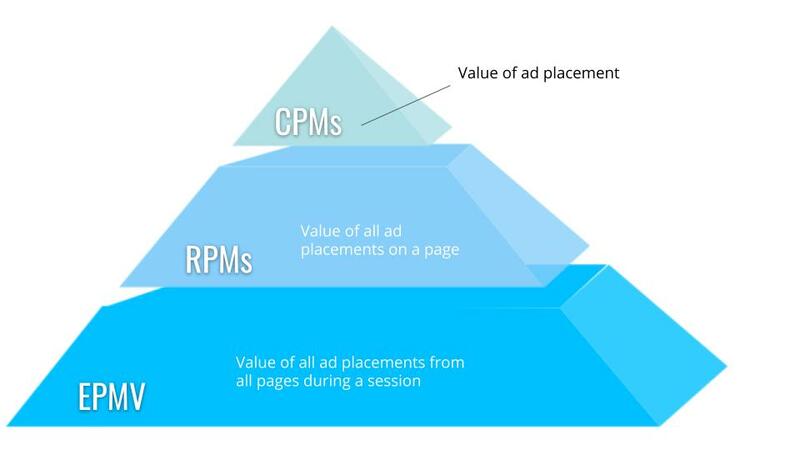 Higher CPM (or even RPM) definetly means higher revenue, right? Actually. It doesn’t (here’s why). In fact, there are literally dozens of ways you could get higher CPMs but ultimately see lower ad earnings. Ad networks will often only count impressions under specific circumstances. There are hundreds of ways that clever networks have come up with to do this over the years. This includes — but is not limited to— counting only specific types of impressions, filling ads for only certain types of visitors, passing back undesirable impressions to other ad networks. Imagine what impression data you would cherry-pick if you were an ad network? You’d probably pick the ones with the highest value —giving you a great CPM. Here’s the problem. All those impressions the ad network is not counting matter to the publisher. While the ad network may technically have a high CPM, the publisher actually has a very low CPM in that ad position. In this case, the ad network will have a high reported CPM, but the publisher’s actual CPM will be much lower. This means that actual revenue doesn’t increase at all. Unfortunately, there’s not really anyone looking over every ad networks shoulders ensuring they are counting each impression. If ad networks can find ways to reduce the number of impressions divided by the number of ad dollars, they can demonstrate a higher CPM. This math only works one way. If an ad network undercounts impressions, they will show a higher CPM to the publisher, but the publisher will make the same amount of money anyway. Ad networks wouldn’t do this, right? It has happened in the past and is almost certainly still happening now. Ads that provide very high click-through rate can often be a terrible thing for publishers. I know. Some publisher actually see this as a performance metric for their revenue! This is scary to me. An ad network that is measuring its performance via CPM has one goal — to generate clicks on a single ad location. This means they could show really intrusive and aggressive advertising to users in an attempt to get them to click off of the publisher’s site. Native ad networks are known to be the worst offendors. They have no interest in that user’s experience on your website, how many pages they view, or if they return to your site. User experiences and revenue are directly connected. We’ve talked about this before, but one of the fastest ways to increase ad earnings is to focus on UX. So how do I actually increase CPMs of my website’s ads? … and please don’t press the back button now. Higher CPMs will not result in higher revenue, but higher value ads and more engaged visitors will. What I’m saying is that attempting to generate higher CPMs is the wrong goal. In fact, I’ve already proven — and shown multiple times — that optimizing CPMs results in lower ad earnings long-term when done in the traditional way. The same strategy can be applied to attracting these high-paying brand advertisers to your site to begin with. Often, publishers think they need to be some new Instagram influencer or uber-popular pop-culture blog to have big brands seeking to buy space on their website. Big brands spend billions every year on programmatic advertising. This means they are often dumping huge budgets into places like Google and other major networks. Their potential to appear at a high ad rate on your website exists right now. Below, I wrote about how to bring these advertisers to your site without any direct outreach. A lot of it centers around good fundamentals. This is what building value in your website’s ad space is all about. Over time, we’ve seen publisher dramatically improve revenue by focusing on engagement metrics over CPMs. If you’re worried you don’t have access to the right ad networks to access these types of advertisers, you can try Ezoic (which connects to thousands) — or if you don’t quite qualify yet — you can try out these AdSense alternatives. They are looking at the value of a single ad. They don’t account for what that high CPM might be affecting. What if it makes total page revenue go down? What if it makes the user leave on their first page (think annoying ads) instead of visiting 4 more pages filled with ads? Publishers should be laser-focused on optimizing EPMV (earnings per thousand visitors) or Ad Session RPM — as AdSense calls it. This is the average earnings a publisher makes per a thousand website visits. If you increase Ad Session RPM YOU WILL MAKE MORE MONEY!!!! The same thing cannot be said for RPMs/eCPMs or CPMs themselves. This is a really hard lesson for a lot of publishers but it is 100% true. 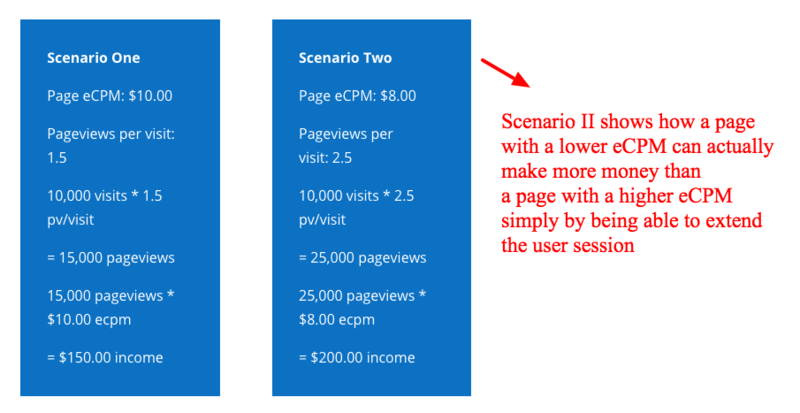 The example above shows how an annoying ad may pay better and increase eCPMs or RPMs, but its impact on bounce rate and pageviews per visit (the visitor’s experience) can actually result in much lower total ad earnings. Still not getting it? Try this video. What should I do to increase ad earnings? I know I have probably flipped things upside down for a lot of publishers that are used to optimizing CPMs and RPMs with little success. Here’s the best way to move forward. Focus on session revenue as a core optimization metric (if it goes up, you’re going to make more money) and focus on visitor engagement metrics to increase ad rates over time (we proved it works). Questions, objections? Want to argue about it? Leave comments below. I understand the two scenarios you are comparing are for a CPM network. If you use a CPC network, you will only be paid when visitors click the ad and leave your site. Is that right? To increase visitor engagement, would posting internal page links help to improve engagement? I have started adding links to other pages in my blog at the top of each post. What other techniques can I try to improve visitor engagement? This is a standard I think all publishers should seek to do. When possible, always find organic ways to link within your own content.